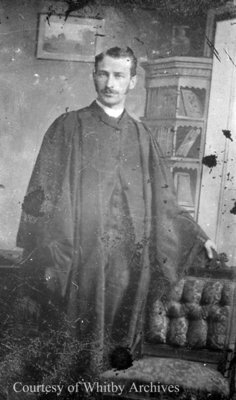 A black and white negative of a portrait of Robert Ruddy dressed in his legal robe. In this view he is standing with his hand resting on the back of a chair. Marjorie Ruddy took a photograph of this portrait (Robert Ruddy is her father). The original photographer of the portrait is unknown. Robert Ruddy was born in Brock Township, Ontario County on April 30, 1861 and was educated in Uxbridge and Port Perry. He was called to the Bar in 1889 and practised law in Millbrook until 1909 when he went to Peterborough. He came to Whitby as Ontario County Judge in 1917 and served until he retired on December 1, 1936. He died at Whitby on November 9, 1940 and is buried at St. John's Anglican Cemetery, Port Whitby. Robert Ruddy, c.1889, Marjorie Ruddy. Whitby Archives A2013_040_702A.